Architect&apos;s blueprint layout featuring a mortar board and diploma. Embossed gold foil lettering on the cover. 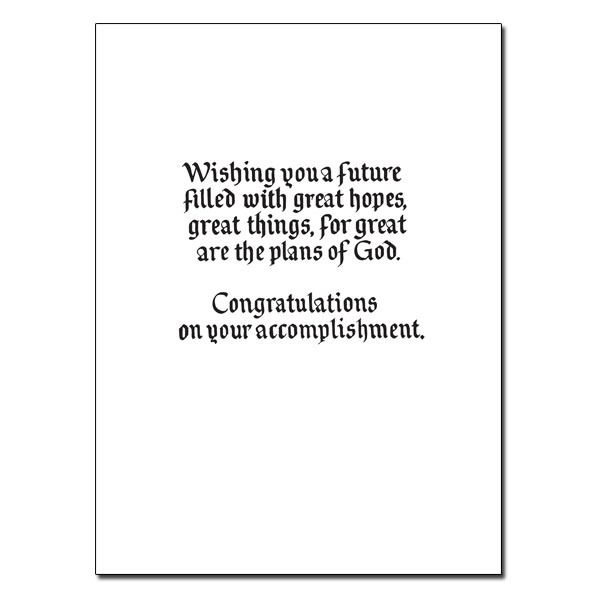 Celebrate this special achievement in the life of a friend or loved one. 5" by 7" with foil stamping. 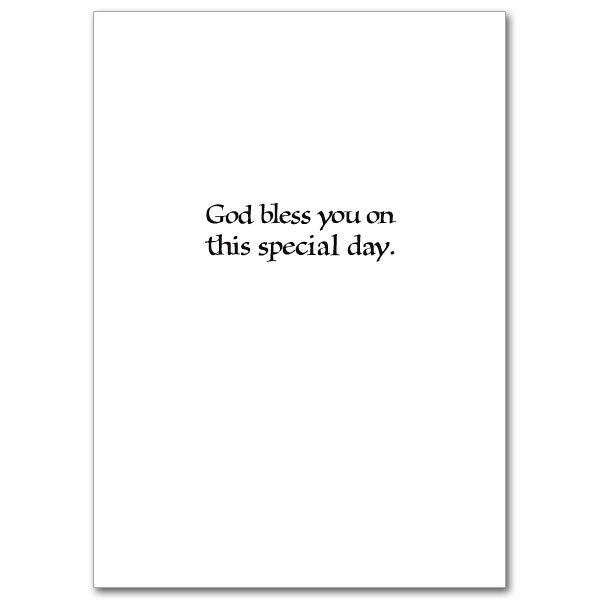 Light green envelope included with each card. Printed on recycled paper with post-consumer fiber. Matching envelope. 5" x 7". 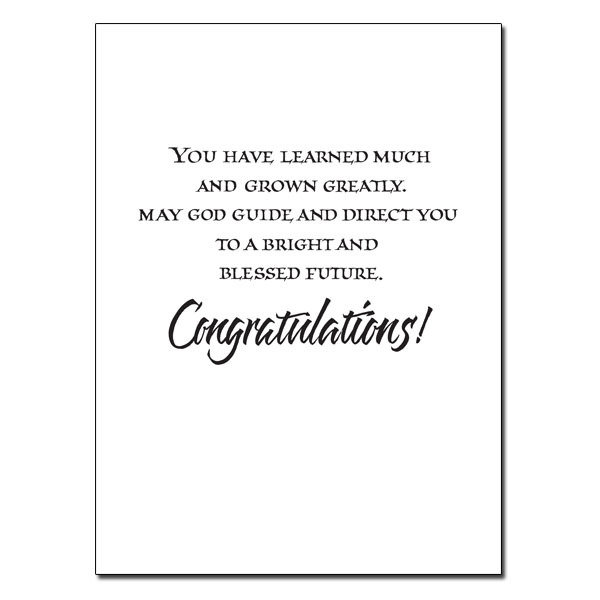 Great to share with your friend or loved ones graduation. 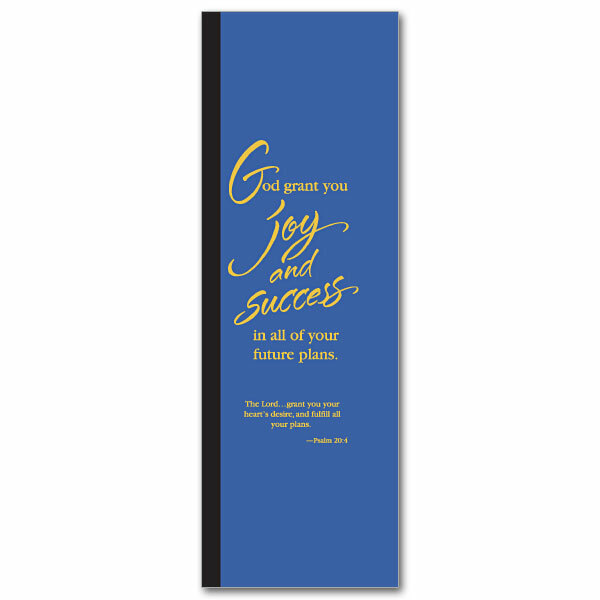 Special money holder size, 3 3/4 x 7 1/4 with matching envelope. Image of an open door in a grand old Tudor building with columns, archway framing the card. Steps are visible through the door leading down to a path below. A mortar board and diploma are perched atop a stack of books at the lower left of the doorway. Book, Lamp of Wisdom, mortar board and Holy Spirit. 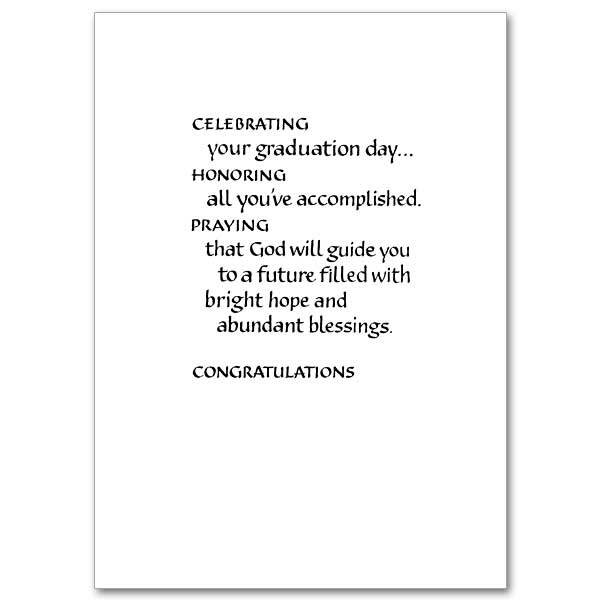 (Gold-stamped) Congratulate those who have achieved graduation! The cards measure 5.93" by 4.38". This card was formerly CA1517. Still life photo of blue mortar board with gold tassel, diploma tied with yellow ribbon surrounded by flowers on an end table; blue marbleized paper border and subtle ornamental design in the gray background. 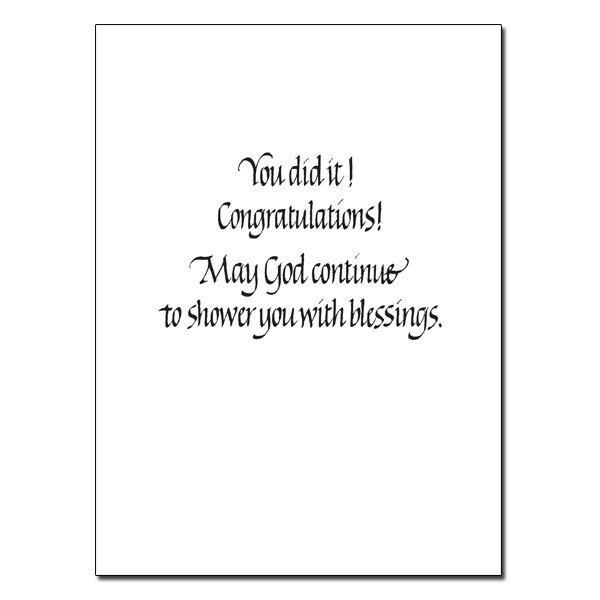 Congratulate those who have achieved graduation! The cards measure 5.93" by 4.38". Column, lamp of Wisdom, bible, diploma, dove, cap on left border with lettering on right. …through car troubles, bumps and hits. So if you have someplace to go and plan on driving there, just pin this Angel on your seatbelt, and relax, you&apos;re in God&apos;s care." 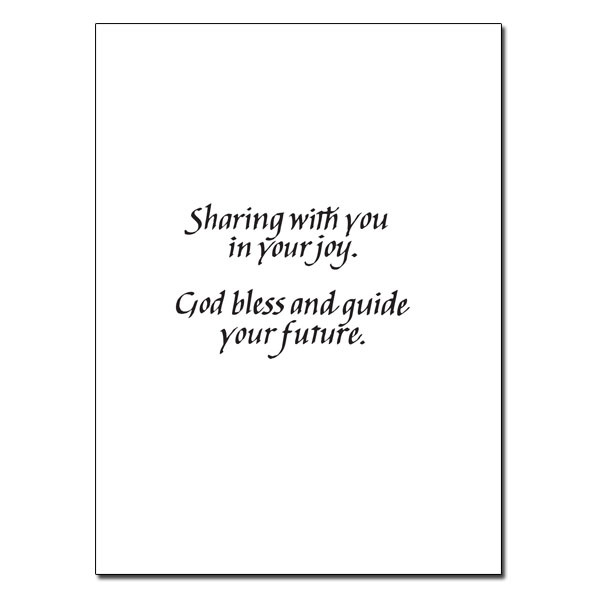 Prayer card comes in assorted colors. Angel pin is approx. 1/2". 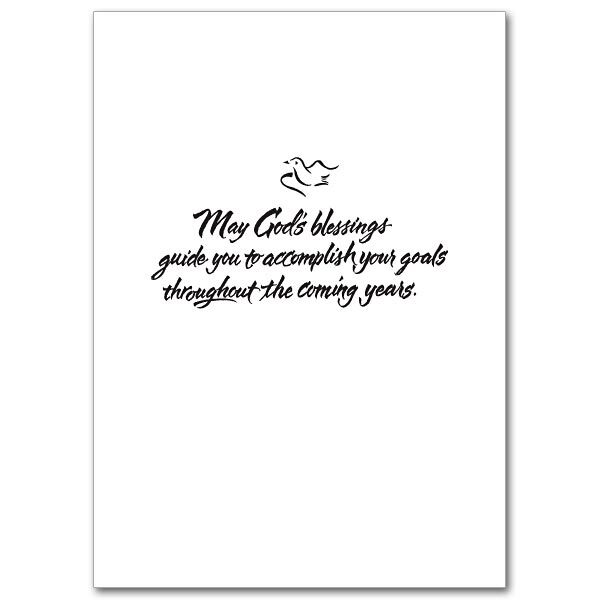 Prayer card measures 2 3/4" x 3 3/4"